Chris Davis’s miraculous “Kick Six” return against Alabama took place two years ago, but the thrilling Iron Bowl win will not be forgotten by Auburn fans anytime soon, and the school has put a hidden nod to the play in its website. Chris Davis’s miraculous “Kick Six” return against Alabama took place two years ago, and the thrilling Iron Bowl win will not be forgotten by Auburn fans anytime soon. What's more, the school has added a hidden nod to the play in its website. 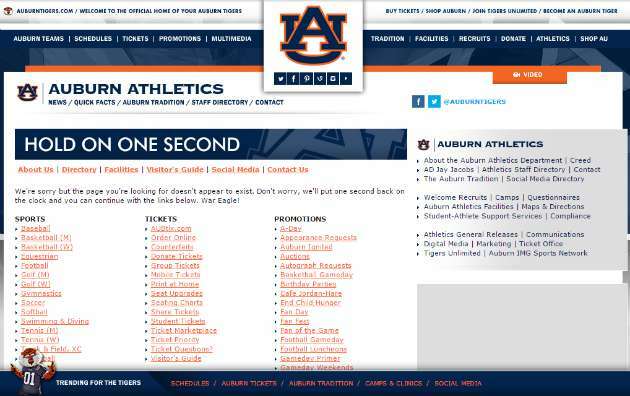 Visitors who find themselves on the Auburn Athletics site’s 404 page are reminded of the play with a message saying they have been directed to the wrong part of the site.